!!! I am sure you all must be thinking i have burnt my fish!!! Well…i like my fish crispy and my meat well done!! The so called “burnt” part of this picture is actually the masala paste which is coating the fish. I could have added some flour but i did not want to. This is a south indian style of fried fish and is usually eaten with what we call “daal chawal” (soupy lentils and rice). I love the crispiness and the tangy lemony spicy flavour this fish has. I chose to make it with mackerel as mackerel is rich in Omega 3 oils and vitamin b12. You can use any type of white or blue fish for this recipe…. cut the head off the mackerel if you want…or leave it..its upto you. Halve it and remove all the stuff from it and wash it well. Pat it dry . Blend the rest of the ingredients into a fine paste and smear it on both sides of the fish and keep it for an hour. Heat the oil in a non stick fryingpan till really hot and carefully lower the fish into the pan and let it cook for about 2 minutes and then turn it and let it cook for another 2-3 mintues depending on how crispy you want it. Serve with a wedge of lemon. I let mine cook for longer as i like my fish verry crispy. If you dont want it spicy just omit the red chilli or you can add a pinch of chilli flakes. Goes excellent with lentils and rice (daal chawal)!!! 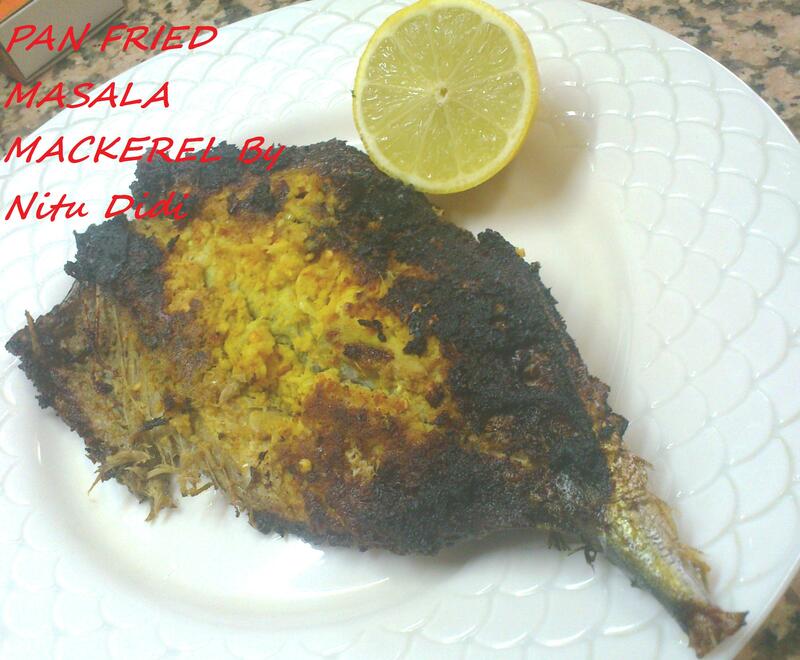 This entry was posted in Healthy Options, Nitu´s Spicy Delights, Something's Fishy and tagged grilled mackerel, mackerel, masala fish, spicy mackerel. Bookmark the permalink.